Mexican President Felipe Calderon will meet with President Obama in Washington next week to address the rising drug violence that led to the shooting of two U.S. agents last week, the Washington Post reports. The visit comes amid rising tensions between the U.S. and Calderon over Wiki-leaked U.S. cables that show deep uncertainty about Mexico’s drug war strategy. Calderon sharply criticised the U.S. for the cables this week, saying that they exaggerate and distort the security situation in Mexico. Last week’s attack against two U.S. Immigration and Customs Enforcement agents, which killed special agent Jaime Zapata and wounded ICE agent Victor Avila, has further strained cross-border relations. 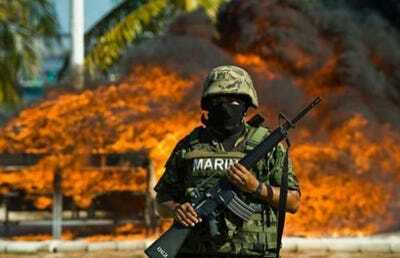 U.S. lawmakers have urged a “heavy-handed” response from the Obama administration, calling the attacks a “game changer” in American involvement in Mexico’s drug war. Calderon plans to meet with House Speaker John Boehner (R-OH) next week. The Mexican army arrested nine people for the attack Wednesday, including a hitman for the Los Zetas drug cartel. The gunmen appear to have mistaken the ICE agents for members of a rival drug gang, Mexican defence officials told the WSJ. Mexican officials did not mention Zeta boss Jesus “El Mamito” Rejon, the Obama administration’s top suspect in the shooting. The U.S. has offered a $5 million reward for his capture. Some U.S. officials and analysts believe, however, that the U.S. agents may have been targeted by the cartel, noting that the gunmen opened fire even after the two men identified themselves as American officials. If this theory proves correct, last week’s incident could be a dangerous signal that Mexican cartels might, for the first time, be using their violent tactics against U.S. agents. More than 34,600 people have died in drug violence in Mexico since Calderon declared war on the country’s powerful cartels in December 2006.